Tent rentals for weddings, special events, construction sites and much more. 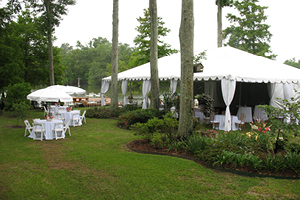 Our expanding inventory, renowned customer service and locations in Lafayette, LA and the Lake Charles, LA area ensures that your table, chair, and tent rental are always of the highest quality. Our affiliate company, Party Central, provides the most distinctive, elegant and sophisticated event and party rentals in the Louisiana area and throughout Mississippi and East Texas. Celebrating over 18 years as a premier event rental specialist, Party Central continues to provide the highest level of customer service as well as an ever expanding tent and event rental inventory.